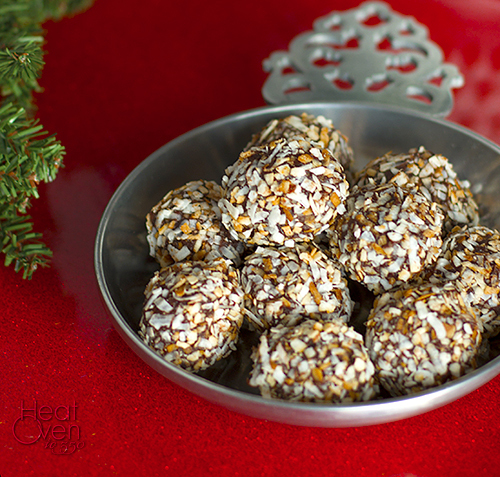 If you are a chocolate lover, or have one in your life, you need these truffles. Rich, dense, full of chocolate flavor and touched with hint a raspberry, they are going to be a favorite this holiday season. Or pretty much any time you can think up an excuse to make them. It shouldn't be hard to convince yourself to whip up a batch, too, because they are so easy to make. If you can heat things on the stove, and stir ingredients together you will be a pro at making these truffles. The hardest part may be waiting for 12 hours for the fudge-like mixture to set up in the fridge. Don't worry, though, you can still sneak a spoonful and no one will be the wiser. Make these for a gift, make these for yourself, make these for a potluck. Wherever you plan on serving them, you will make any chocolate lover's day. Bring the cream to a boil in a medium saucepan over medium heat. Reduce heat to low, add chocolate and stir until smooth. Stir in butter and raspberry preserves. Transfer chocolate mixture to a bowl and refrigerate at least 12 hours. When mixture has chilled, scoop out 1/2 tablespoon amounts (or size desired) and roll into balls. 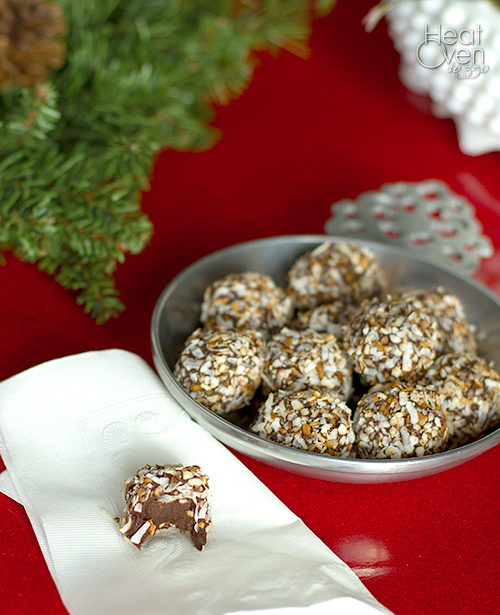 Roll in toasted coconut and serve, or refrigerate until serving. I haven't ever attempted truffles, even though they seem so easy! Although waiting is definitely hard...and also the rolling a ton of little balls, hehe. I love that there's raspberry in these! These are just for me…really. I love chocolate, raspberry, and coconut is one of my favorite things in life. These would be a great gift or perfect for the holiday party tray. Beautiful truffles, Nicole! What a great picture. The recipe looks so delicious.